Perfect for April, your students will love these digital self correcting task cards. 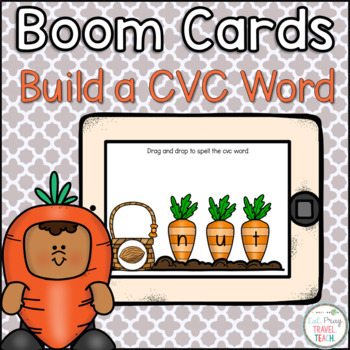 Have your students practice their letter-sound correspondence with these build a CVC word cards. 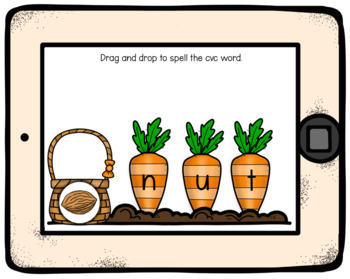 Students will drag and drop the carrots with the letters in the correct order to spell the CVC word. When students submit their cards to be checked it will eliminate any letter that is in correct. The student will need to correctly answer the card before moving on to the next one. Cards will review all 5 vowel sounds. **These cards are digital only and must be utilized using Boom Learning. Boom cards a paperless, interactive and self-correcting tool to have your students practice skills. They will save you time and money as there is no prep required. Simply share the fast play with your students or assign through your classroom.